Bring Turkish cuisine into your home with this recipe for homemade Iskender kabob that is so easy, even for those chefs whose kitchen expertise is largely confined to opening take-out! 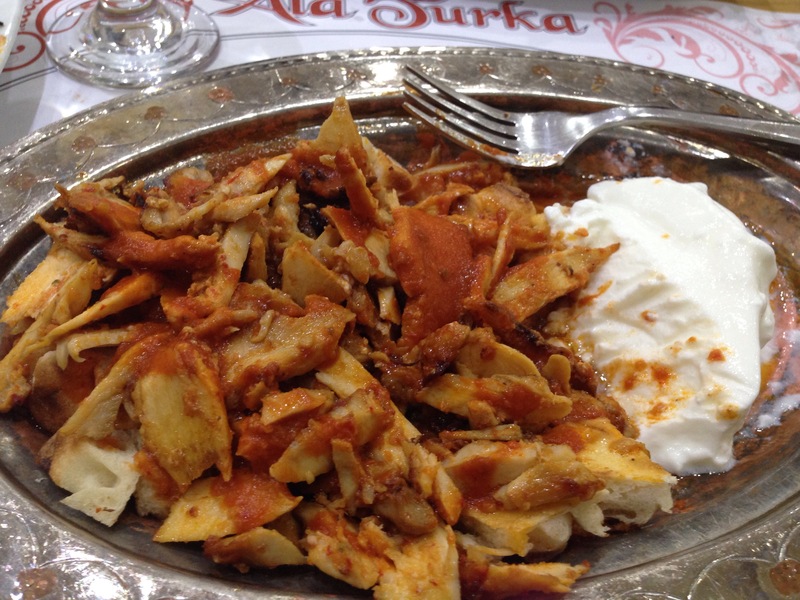 In my last post, I shared my first experience with the Turkish Iskender kabob. Roasted meat, toasted flatbread, tangy tomato sauce, and tart yogurt combine for a perfect supper. It was so buttery, rich, and filling, and yet so simple, I had to find a way to recreate it myself. In lieu of doner meat, I substituted rotisserie chicken, but one could also use pulled chicken or beef, or roast lamb. As for flatbread, this recipe is a good way to use leftover, stale bread. You could use pita or even naan, but my preference is for a more authentic, pocketless flatbread. Its soft, spongy texture soaks up the butter and sauces better than a thinner pita. Also, feel free to substitute a basic canned or jarred tomato sauce for the fresh tomatoes – though if you do, choose one without Italian herbs. It saves the step of pureeing the tomatoes as well. Then add the garlic and butter according to the directions below. In my version below, I use a minuscule amount of butter (though it might not seem like it) relative to the authentic recipe. I can’t bring myself to overdo the butter in my own home. To add more flavor, I suggest adding za’atar spice blend (available at spice or Middle Eastern specialty markets) and/or Harissa (a spicy, North African red pepper condiment). Wash and slice tomatoes in half. Place them, skin side up, on a baking sheet lined with aluminum foil or parchment paper. Roast for 20-30 minutes, or until the skins begin to wrinkle and brown slightly. Remove from oven and reduce heat to 350 degrees. Use a towel or knife to remove the skin from the tomatoes; the skin should separate fairly easily. Set aside. Toast the flatbread in a toaster oven or in the oven on a baking sheet for 5-10 minutes. Meanwhile, line a baking sheet with aluminum foil. 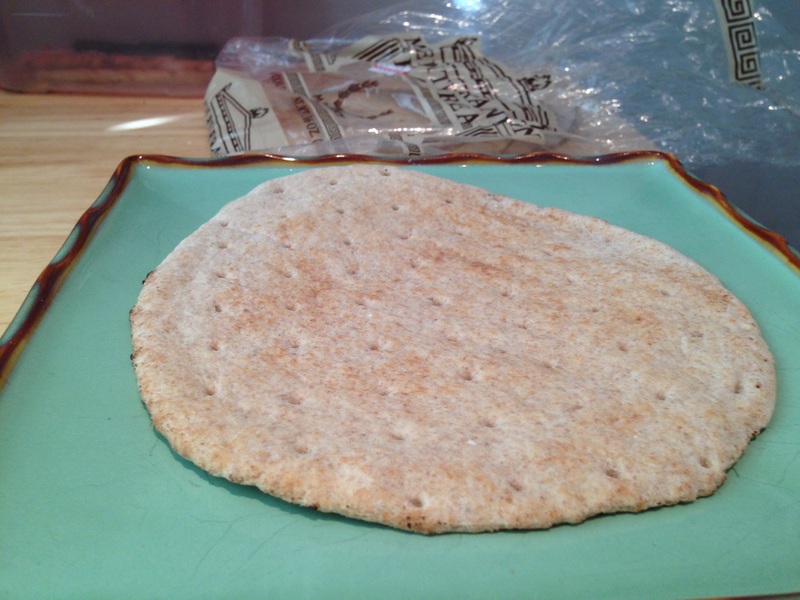 Cut or tear the toasted flatbread into approximately 1″ chunks. Arrange the meat and bread on the baking sheet. Melt 1 tablespoon of the butter in a small dish. Next, drizzle the butter over the meat and bread mixture and toss by hand. Bake the bread and meat mixture for 10 minutes, or until the exposed bread and meat begins to crisp. Make the simple tomato sauce. In a food processor or blender, place the tomatoes and garlic and purée. Next, in a small saucepan, melt the remaining tablespoon of butter over medium-low heat. Add the tomato-garlic purée to the saucepan and stir to incorporate. Bring the mixture to a simmer. Remove the meat/bread from oven. Transfer the meat and bread to an oven-safe plate or small casserole dish. If making the entire recipe to be consumed immediately, pour all of the tomato sauce over the meat-bread mixture in the casserole dish. If you plan to eat only one or two servings immediately, portion out individual one-cup servings onto plates and pour about 1/2 cup of the tomato sauce over each. Spoon the yogurt (or a 1/4 cup portion over individual servings) on/in the baking dish on the side. Bake for 15 minutes until heated thoroughly. Serve immediately. If serving to guests, you may wish to serve it with melted butter that guests may pour over the kabob to suit their tastes. If healthy or spicy is preferable, serve with zata’ar and/or Harissa. I suggest balancing this dish with a leafy green salad, though not traditionally Turkish …unless it’s sliced onions and parsley!